There was a time when I would avoid writing about cancer because I felt like it was a cheap way to put together some content. I mean, people don't spend time writing articles about breathing, but yet they do it every day. Then it recently occured to me that I can help people with cancer by talking about things doctors cannot talk about. Being diagnosed with cancer is difficult enough without the ensuing fog of confusion that comes with it. I am going to try and be your light in that fog and help you get through a very difficult time. No matter where you go to get your cancer treatment, the exchange of information between you and your oncologist can be frustrating. As the person experiencing cancer, you want answers that your doctor simply cannot give you. They are not allowed to try and be fortune tellers, and none of them feel comfortable telling you things that may or may not be true. So, let's break down why your oncologist seems to not be forthcoming with information you feel that you need. Why can't my oncologist give me a prognosis beyond some generic outcomes? Your oncologist can only tell you what they know, and most of that is because of state laws. With cancer, no two patients react the same way to the same medication. Your oncologist can look at your scans and give you what seems like a generic prognosis, but that is all they can do. In all honesty, your oncologist has no idea how your body will react to any treatment. You might grow horns and turn into Hellboy with your next treatment. Well, probably not. But your doctor only knows what the meds are supposed to do. When those meds get into your system and meet up with your cancer, anything can happen. It feels like, sometimes, my oncologist is not telling me everything. There is a good chance that your oncologist is leaving out information when talking with you about your condition. An oncologist is like any other doctor in that they spend time getting to know their patient so they can figure out how that patient will process certain types of information. Both my oncologist and my primary doctor know that I do not handle bad news very well. So, they have both come up with ways to tell me things so that I am informed, but I am also not climbing the walls. In my time with my oncologist, I have had access to information that indicated that my oncologist decided not to give me bad news about certain parts of my treatment. He did that because he knows me, and he also wanted to see how bad things got before he told me anything. Luckily, the situations where he withheld information righted themselves and everything was fine. I know what you are thinking. You are thinking "How dare a doctor not tell you something! That is irresponsible!" As I said, my doctors know how to talk to me. If there is life-threatening information I need to know, they tell me. But if you have never had cancer, then you have no idea how stressful it is. The last thing your doctor wants to do is make things worse by giving you information that you may or may not need. Your oncologist wants you to focus on positive things and remain in a positive frame of mind. One thing is for sure, there is nothing I could have done about the information my oncologist did not tell me. It also did not affect my treatment. But not telling me helped me to remain calm and positive during a difficult time. That is what your doctor always wants to accomplish. There is a deep psychological element to what an oncologist does as well. Sometimes an oncologist will not tell a patient certain types of information because the oncologist knows the information will not be handled well by the patient, and there is nothing that the oncologist or the patient can do about the information. Trust me, everyone says they want to be an active part of their treatment when they have cancer. But when the stakes are that high, you just have to trust the medical professional's judgment based on their years of helping others who felt they wanted to be involved as well. This column is going to be dedicated to the struggles people have with cancer. I have insights, and maybe I can help. I am going to try and tread lightly in some areas out of respect for the hard work oncologists do in trying to keep people like me alive. But the honest truth is that cancer patients, for the most part, are in a fog when it comes to real information. If you have questions, you can send them to me. I will answer them the best I can. Next week we will start looking at some of the most important aspects of having cancer that no doctor will ever discuss with you. Remember that doctors don't do anything out of malice. You need to look at the world from their perspective. Every day, patients walk into an oncologist's office eager to hear how that doctor is going to keep that patient alive. The pressure is incredible, and oncologists have ways of handling that pressure that benefit themselves and their patients. 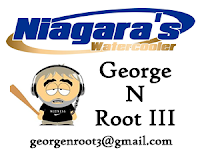 George N Root III is a Lockport resident, writer, and guy with cancer. You can contact him at georgenroot3@gmail.com. If you have any questions, do not be shy about writing. If you want to send thoughts and prayers, please put them in an envelope and mail them to the North Pole. Santa could use them more than I could.